Posture is everything. If you’re slouching when sitting or when standing up, your core is not engaged. It follows then that your spine is not in the proper position. It’s easy to neglect your posture, especially when sitting at a desk all day. Make every effort to keep feet flat and uncrossed on the ground and at a 90-degree angle to the floor, pull in your stomach, and keep your back straight. Concentrating on these small efforts can help you get through a day at your desk, as can sitting in an ergonomically correct chair, adjusting your computer to a sensible height, and even working at a standing desk. Resting is good for back pain, but resting in the wrong position can do more damage. Any sleep position can cause pain if you’re in it for long enough, but you can help yourself have a more comfortable night of rest with a few small efforts. Using pillows (namely, between your knees to keep your spine in a neutral position) supports the lower half of your body. Avoiding stomach sleeping means you aren’t twisting your neck and head unnaturally or putting undue stress on your back. Smoking isn’t good for you no matter how you look at it, but this bad habit can also cause back pain. The small blood vessels constrict because of the nicotine and, as a result, the delivery of blood to the soft tissue is decreased. Current and former smokers are more likely to experience backaches than people who have never smoked. 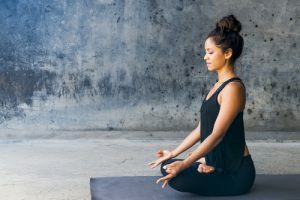 You might be tired of hearing people suggest that you should take up meditation or deep breathing, but these relaxation techniques put the mind at rest. When you’re focused on your breath, on being present but letting go, the relaxation response can reduce your perception of your pain level. And, these efforts can help ease the tension you’re holding in your back or other parts of your body. The endorphins released through meditation can help alleviate stress, anxiety, and depression, which are also associated with exacerbating back pain. Do you invest in good shoes? You may not like to shell out for pricey footwear, but changing from flat flip-flops to arch-supporting sneakers can make a big difference in back pain. You aren’t doomed to unsightly, clunky shoes. Simply being smart about how you’re covering your feet can make a difference in how your back feels at the end of a day. Carrying a heavy bag can also push your back out of alignment, especially if you always carry a bag on one shoulder. A crossbody bag or messenger bag has a long strap that allows you to position the bag across your chest in either direction, evenly distributing the wait. There are no quick fixes for back pain, so when the DIY methods aren’t helping anymore, it’s time to get professional help. Schedule a consultation with the Restorative Wellness Center in Ann Arbor and talk to Dr. Daniel Geck about your concerns.